From this location, the repeater will provide fantastic Hand-Held coverage to the Franconia, Lincoln, Littleton and Plymouth areas. It also will cover areas ranging from Montreal to Boston. It also covers North and South along I-93 just fine. I've worked the Repeater with a portable from downtown Manchester - a good couple hours drive time away. 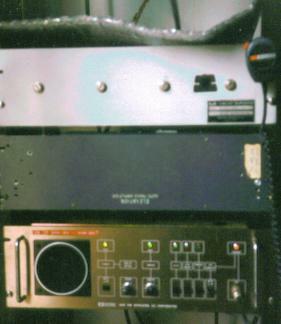 The Repeater equipment consists of an Icom RP-3010 UHF repeater driving an outboard Mirage D-1010 Power Amp. a GLB preselector/preamp, more to keep the front end narrow than to perk up the Icom's hearing. There is an Astron power supply running the amps as the repeater itself is self powered. The repeater is controlled by an S-COM 5K repeater controller. I yanked out the original Icom controller and put the S-Com in it's place right in the repeaters cabinet. This keeps the actual amount of physical room needed for equipment and rack space to minimum. Plus the 5K is much more flexible and reliable. The antennas take quite a beating up there, in fact, it's not uncommon to have winds in excess of 100 MPH!! 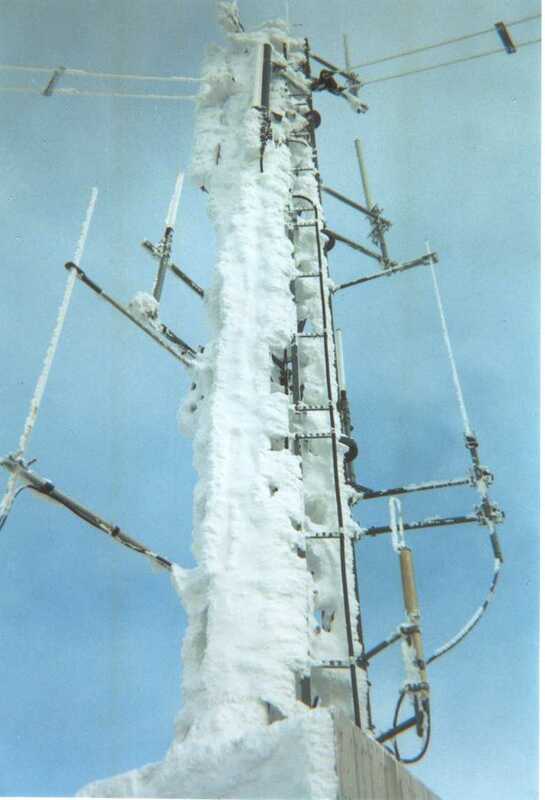 Given that plus several inches of Rime Ice, makes for quite an amount of stress on any antenna up there. I've actually seen in excess of 4 inches of rime ice built up on everything exposed on the summit. It's quite a sight!! The picture at this link shows the summit of Cannon from across the Notch, as taken from Mt Lafayette. The repeater is located right on the top there. 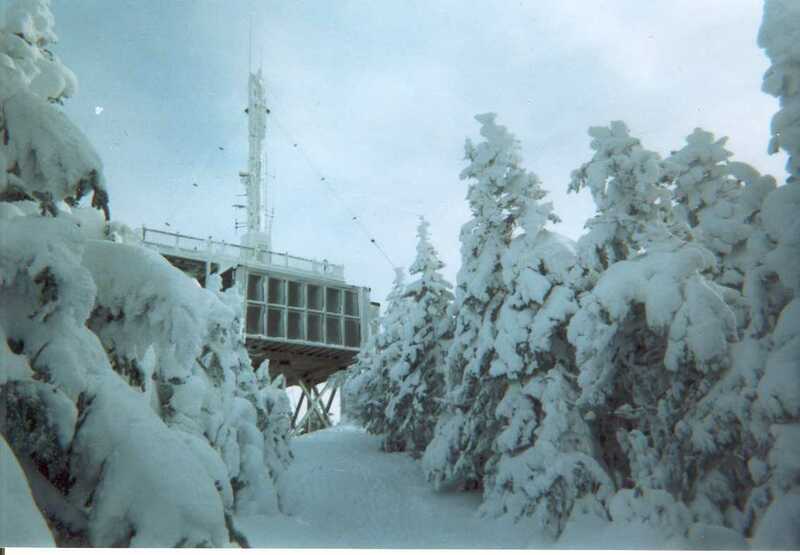 Go to this page if you're interested in looking at some other pictures of the Summit of Cannon Mountain and the UHF repeater equipment. Linking up to Cannon is done as a "user" with a UHF remote base at the Keene repeater site using a beam looking up North. The linking is only part-time, however, it can be remotely controlled from the Cannon Repeater. 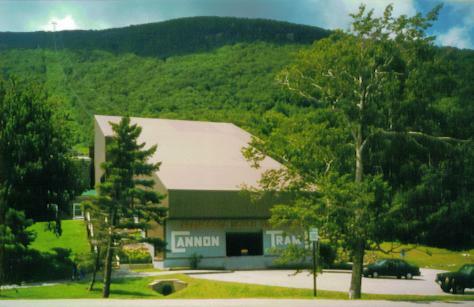 The Cannon Repeater had to undergo a frequency change in April of 1992. This wass because after the Repeater went on the air, somebody in Montreal decided to set one up on the same frequency pair - except reversed. Good thing I ran full time PL, but you can just imagine the howling they used to do when the two repeaters would "talk" to each other! Anyway, life has been good on this frequency ever since! Sometime toward the middle of October of 2007, I received an email from a friend of mine that lives in the area basically that said "hey, they're cleaning off the summit of Cannon and removing the old fire tower. I know you've got stuff up there and thought you ought to know." I said that the repeater was located in the NHPTV building and on their tower, so that shouldn't be an issue....Little did I know at the time just how wrong I was!! After a few days, I received a message from the current Chief Engineer at NHPTV telling me that the NHPTV building and tower were also being removed and that I needed to get the repeater and antenna down asap, as it was going to be removed within a couple days. I managed to contact him and confirm that was true and then began the process of the logistics of getting stuff down. This also began my thinking process to see what needed to be done to get on the new tower up there. Everything I had heard up until this point was telling me that I was gone, and no provisions of returning were going to happen. This was not an acceptable solution! This repeater has been in continuous operation for 17 years, and it was the first amateur repeater on the summit. It just didn't seem right that it be so casually "tossed" off. I knew that I also needed to contact DRED - the state agency that manages the state park mountain tops, and so I started gathering information and drafting a letter to "state my case". In the mean time, I sent out a few emails on a couple message reflectors informing the locals, and the state ARES group of what had happened. I also began receiving numerous emails as a result of the reflectors. Now before I had a chance to get the letter done and make contact with DRED, I had been approached by them! My first conversation with them pretty much was - some of my emails had made their way to the Governors Office, and the flood of inquires that followed were gathering some attention. In a nut shell, I was asked to Stay!! All the other services that were on the other towers were being located in the new building and on the new tower - including me! I was very happy that I hadn't lost access to the site, but as of right now, I still haven't gotten the equipment re-installed, primarily because winter has arrived, but if I can swing it, I'll still be putting it in! Seeing as I live 3 hours South of the repeater site, and can't just "drop everything" and head up there, I began making phone calls to a really good friend of mine - Mike, N1IMD, who also just happens to work at Cannon and say, hey, if you happen to have a little time, could you take the repeater down? He agreed to do this, but as luck would have it, the weather turned bad, high winds, rain, etc... and the tram was having some maintenance done to it, so that wasn't happening. The good news about the bad weather was that nothing else was happening either. This bought me a little time, so that I could get up there and get it myself. In the mean time, the NEW repeater has been assembled and tested back at home. There will be a Motorola MSR2000 repeater re-installed with an ACC96 controller. The lastest info now is that SP radio needs to change antennas and in order for that to happen, "they're" supposed to do the tower study. I do think this will probably happen sooner than later, but once again...who knows! So... Still off the air, don't know for how long and I'm still working on it!